Description: Solitary stony coral. Corallum often tall and inversely conical, its texture is slightly spongy but less so and tougher than Balanophyllia, up to 60mm tall and nearly 20mm in diameter. 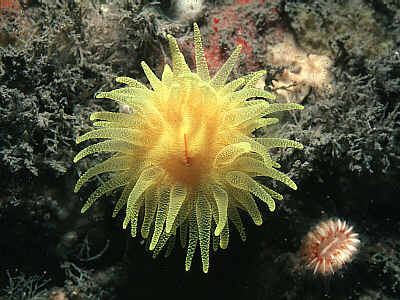 The polyp is yellow or orange in colour and has up to 96 tentacles. Habitat: Attached to rocks in crevices sheltered from strong water movement; from about 10-40m. Several corals may grow together, forming a pseudocolony. Similar Species: Could be confused with yellow or orange specimens of Balanophyllia regia but Leptopsammia pruvoti is a much larger species. Yellow (rarely orange) polyps with up to 96 tentacles. Corallum often tall, slightly spongy in texture. Picton, B.E. & Morrow, C.C. (2016). Leptopsammia pruvoti Lacaze-Duthiers, 1897. [In] Encyclopedia of Marine Life of Britain and Ireland.